Solar energy workshop offered beginning of August- click here for more details. Click below to find school supply lists for our new and returning Dragon family! Britton Johnson placed seventh in Mathematics at the National Beta Convention in Savannah, Georgia. 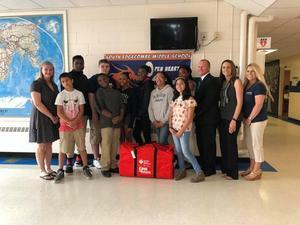 Smithfield Foods and The American Heart Association gave South Edgecombe a CPR kit to train eighth grade students in CPR. BETA students from our school participated at the NC BETA Convention February 5th and 6th, 2018. Click below for more information! Click above to see a quick message from some of our Eighth Grade students! Students in grades 6-8 are challenged to build an object using K'NEX, a versatile, creative construction product. Teams of 6 composed of 2 students from each grade level will design and build the required object using a blueprint that they develop together as a team. At the competition they will present a narrative report in writing or video, submit blueprints and cost results and build their object within a two hour time limit. This event will be held at Tarboro High School on March 21, 2018.